I work (in a uniform) and it's not pleasant in this weather. But I'd happily have 3 months of this every year in summer, it's not 'selfish'. Nearly everyone is happier in this weather, especially when it occurs on a weekend, as they can enjoy the outdoors/their garden/the beach etc without wearing 20 layers and freezing or getting blasted by winds or soaked, like the other 9 months of the year. And back to sensible Model Discussion.. please use the banter/moan thread for general chit-chat. My brother lived in Paris for 20 years. Like the difference between Leeds and London, the general temperatures in London and Paris are very similar, but Paris normally gets hotter in heatwaves than London and it lasts a day or two longer there, too. Used to annoy me at first but that's just how it is, no point getting upset about something normal. And 22C in strong June sun won't feel too shabby. It isn't normal at all though. It does happen occasionally but there is a big difference between something that happens occasionally and something that is normal. Yes, occasionally the difference between London and here will be significant, but that is not normal in the slightest, not even during heatwaves. The only thing that is normal is that the heatwave might end a day earlier here. What I want, is something akin to the hot spells of 2013, or 2015, or 2016. Going back further in time - 2006, 2005, 2003, 2000, 1997, 1995, 1990, 1989, etc etc etc. That is surely not unreasonable, and I getting sick of people like you telling me to 'get over it' because apparently 'it's normal'. Not on your nelly. It isn't normal at all though. It does happen occasionally but there is a big difference between something that happens occasionally and something that is normal. What I want, is something akin to the hot spells of 2013, or 2015, or 2016. Going back further in time - 2006, 2005, 2003, 2001, 1997, 1995, 1990, 1989, etc etc etc. Nothing to say it won't happen like those years, we are due a properly hot summer. There'll always be a front or two passing by from time to time though, and generally areas N and W will suffer the effects first. ECM still stubbornly making more of the ability of the LP systems to find their way close to or even over the UK beyond Thursday. Puzzling times with that model - what's making it act so differently to the others? Will just have to let it lie until tomorrow and hope it falls into line then (as opposed to turning out to be the only one on the right path!). Essentially we're still cooking with the formerly Azores High tomorrow and as such the heat should again generally be greatest the furthest you are from land within England and Wales. Monday sees the Spanish Plume start to make itself known across the far south while remaining areas are still stewing in the airmass from the weekend. So peak temps occurring not just well inland but down to within some 30-40 miles from the South Coast. Tuesday sees the cold front produce a band of suppressed temps for some central parts (but note that it's more fragmented and so limited in effect than what GFS has been producing), while the far-south is fully enveloped within the plume, resulting in some fairly impressive peak temps (locally up to 33*C perhaps?). Worth noting though that GFS has adjusted the plume influence downward slightly on the 12z compared to previous runs so it doesn't get above 27*C although this could still allow for 30*C in places given typical model error. By Wednesday we have the interesting situation in which the plume is angled SE-NW through the SW'rn third of the UK, resulting in the highest temps occurring in the vicinity of Bristol. Tomorrow evening we'll have ARPEGE's take on Thursday to examine. Could well be some entertaining numbers with that . I second that! The contrast between Scotland and the rest of the UK this week has been incredible. 22C here today despite mostly overcast conditions, an improvement yes but more rain tomorrow. The middle of next week is my best chance to see hot weather, but that low grazing the west seems to spoil the temps. If I get the big storms then I will not complain one bit! I disagree, in many heatwaves SE temperatures are usually higher, often significantly so. What isn't 'normal' though is the actual heatwave itself! I never said 'get over it'. But it's a bit like someone in Brest or Paris complaining that Toulouse or Marseille is sometimes much hotter and sunnier. Illogical when they are hundreds of miles apart. 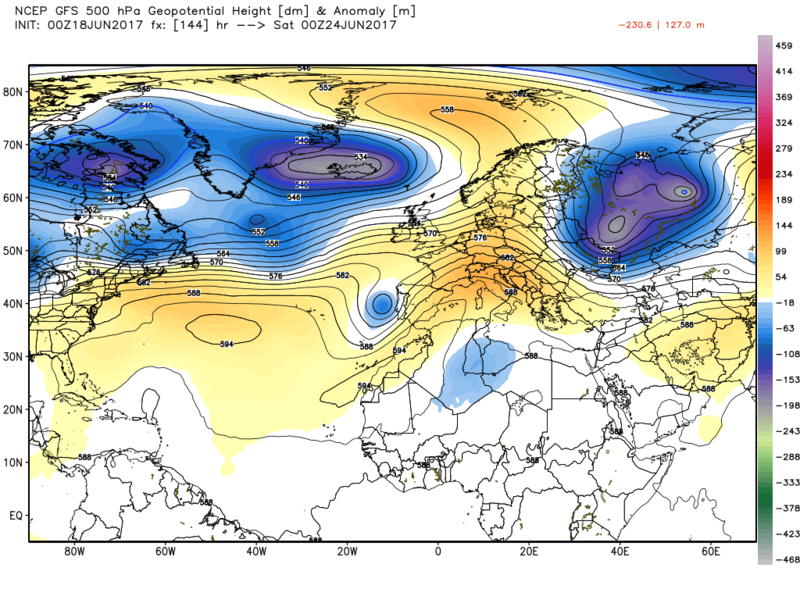 Looking through the GFS ensembles there are some stunning members in there. 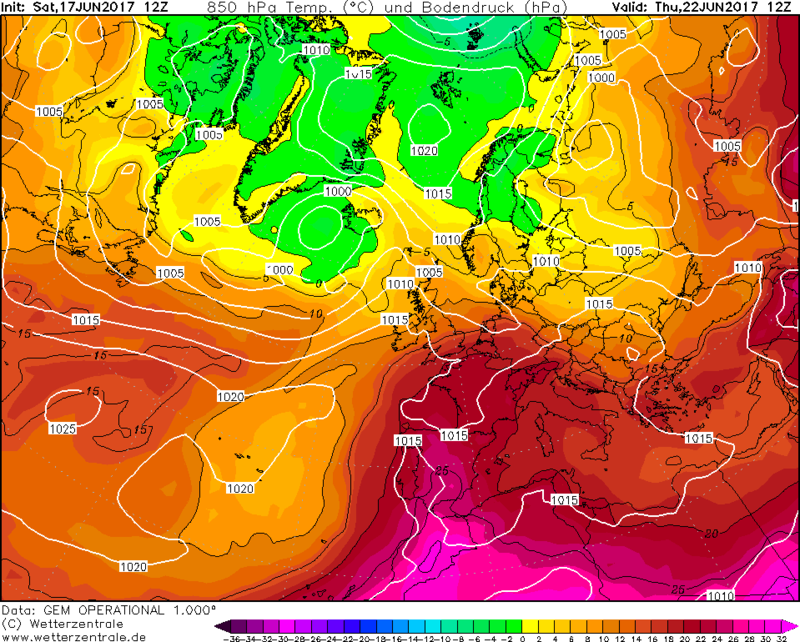 All have a peak in 850s on Weds/Thurs and many see them approaching 20C. P8 is the hottest. 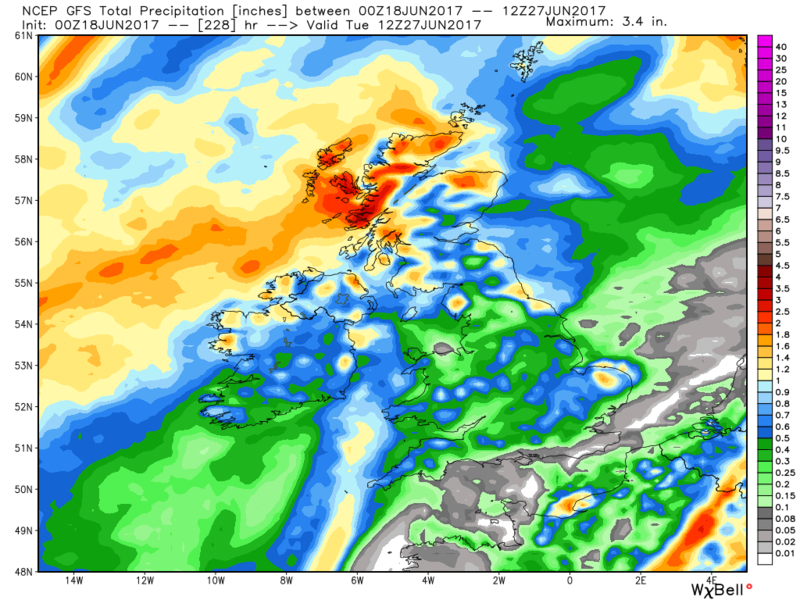 I genuinely think the June record maximum is under serious threat. 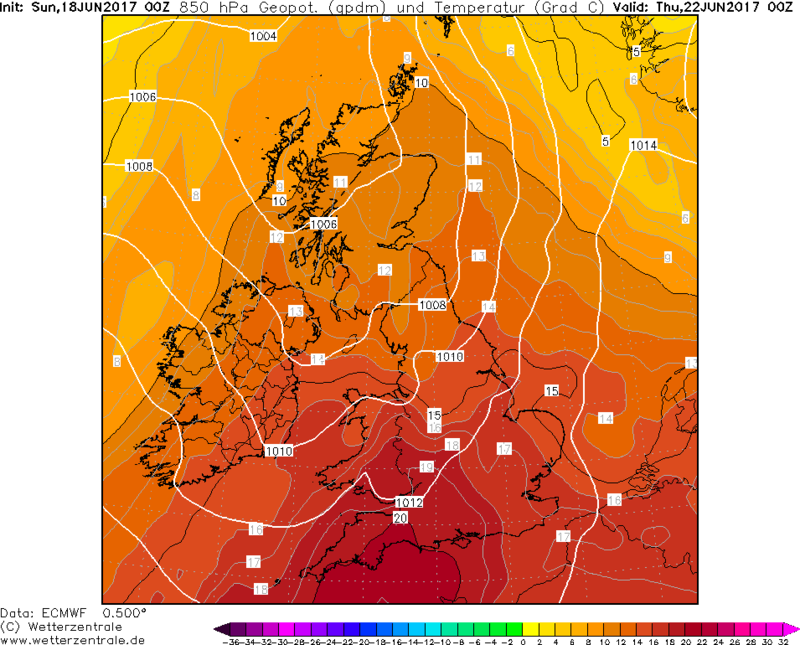 In the South the heat will have hung around for quite a while and we already have the hot temperatures over France to assist us. 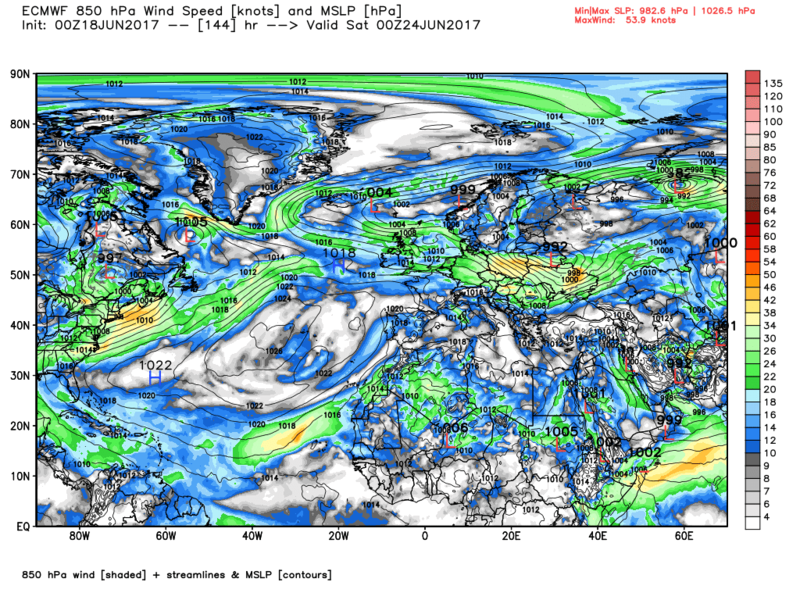 Then we have a substantial number of runs threatening a reload with a load of hot air over the near continent. 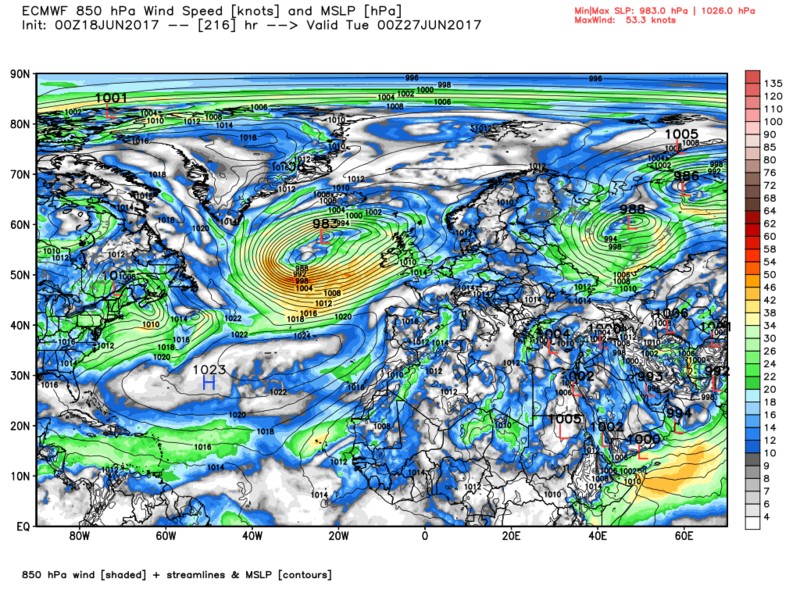 Many of the ensembles bring several days of potentially thundery conditions. Interestingly, the SST pattern across the North Atlantic is similar to 1995 with a cold blob (very deep) just off the coast of the NE USA. The summer of 2015 was exceptionally hot across Europe and that also contained a cold blob in the North Atlantic. This year it is further west. 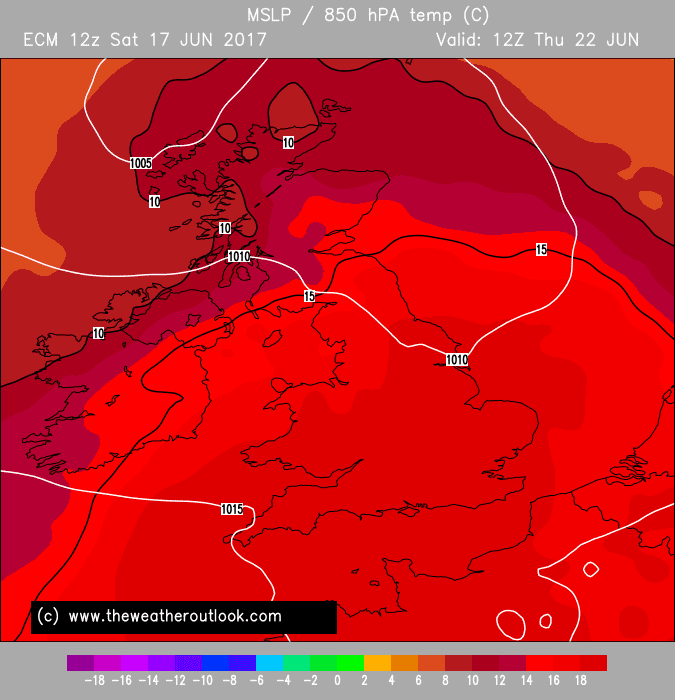 Will the focus of the heat be further west this time round? I genuinely think we could be on the cusp of something special and Thursday could well be a notable day meteorologically, but the risk of the cooler air coming in more quickly then forecast remains. Agreed with Cheese the difference we saw today is the typical difference between London and Northern England: 2-4C warmer. 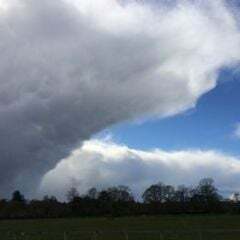 The situation on Tuesday is not as common due to a front over the country and a small part of Southern England being ahead of that front in the warmer air. Though tbf it looks like it will only be Tuesday and Wednesday like this, Sunday, Monday and Thursday looks good for most of England. I think it would be exceptional to beat the June record - I'm going to stick my neck out and say no, I favour something around 33c myself! Pretty significant hot spell either way, if we hit 30c 10 days In a row, when was the last time/ how many times has this ever happened in the UK weather anoraks?? Funny you should mention 1976 because the more I see and read the more I think we might just be in with a chance of repeating that epic early summer spell. As excited as your getting i would suggest that something more like 2005 is realistic. We had a hot and largely settled mid-June to Mid-July period in anotherwise dry but not outstanding summer. The general theme of the evolution this week is unchanged. The upper trough disrupts today creating the cut off upper low to the south west that, in conjunction with the HP to the east. briefly initiates some more WAA in the south east on Thursday. Temps SE of a line Bristol to the Wash could well reach the low 30s in places. 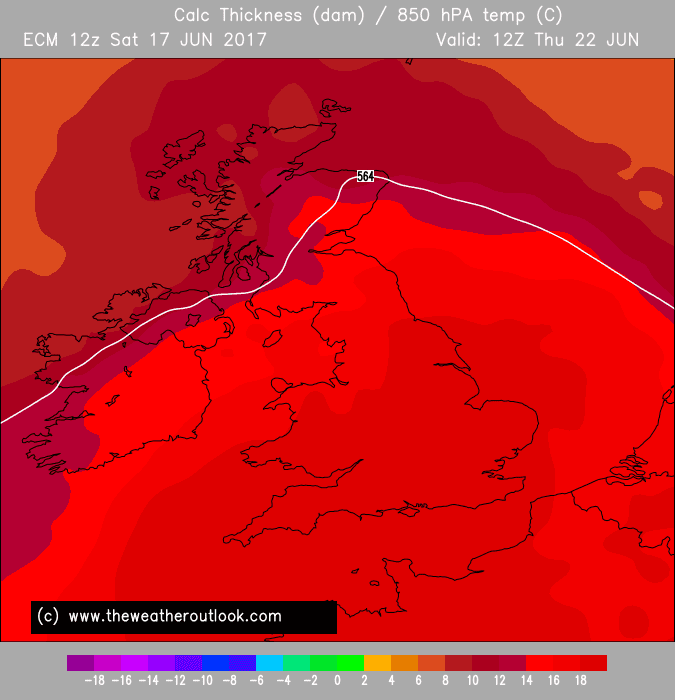 This is looking like the swan song of the 'hot' weather as the energy driven trough(s) to the NW become more influential which the anomalies have been indicating for while. Not that means disaster just a cooler (relatively) and more variable interlude. A very brief slightly more detailed overview. Our current high cell slips east to be immediately renewed from the west. but this is quite a mobile scenario so by 12z Wednesday this in turn has been relegated to the North sea, thus a southerly flow, with a weak front pushing in from the west. By 18z Thursday the high pressure is more or less out of the picture and with the low to south west filling a very slack pressure are UK-to the Shallow Iberian low is briefly created with the trough the WNW nudging east. 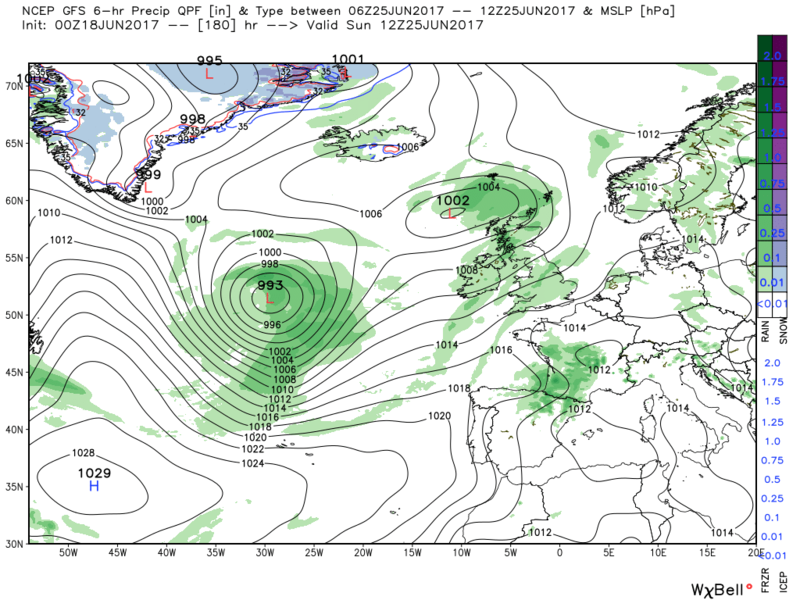 From here low grade skirmishes between the Azores and the Atlantic trough ensue with a weak front traversing the country on Saturday/Sunday bringing spasmodic precipitation, mainly to the north. All in all not a bad week but some marked geographic variation vis temps and cloud. Wednesday not dissimilar but perhaps a couple of degrees warmer further north. Thursday already mentioned and Friday ranging from 12C in the NW to generally 17-23C in England with only Kent being slightly warmer. Still absolutely stunning charts this morning after we picked up on extending the heat just before the weekend. I wonder how many times we will get to 30c and above from now till Friday. Saturday breached 30 in places south of London. 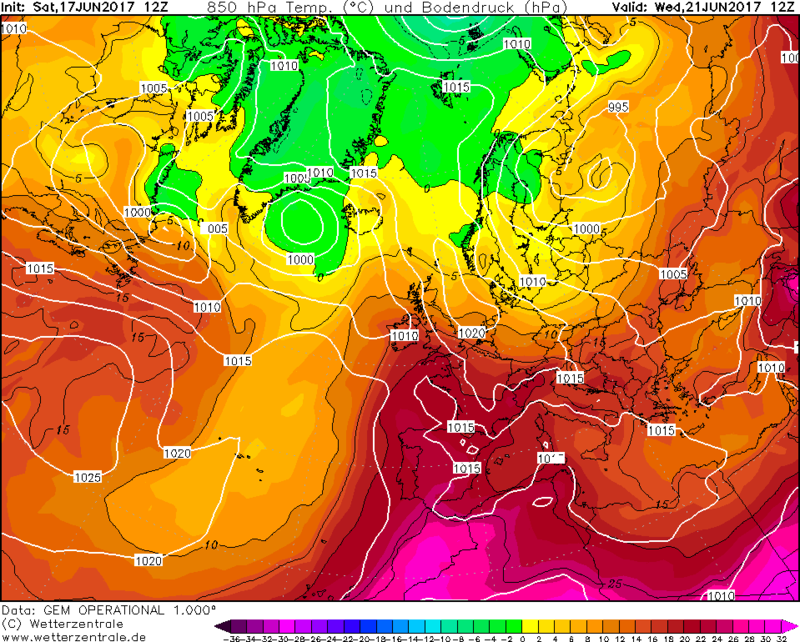 And the GFS although a long way of is trying to ridge more heat later on in the run. 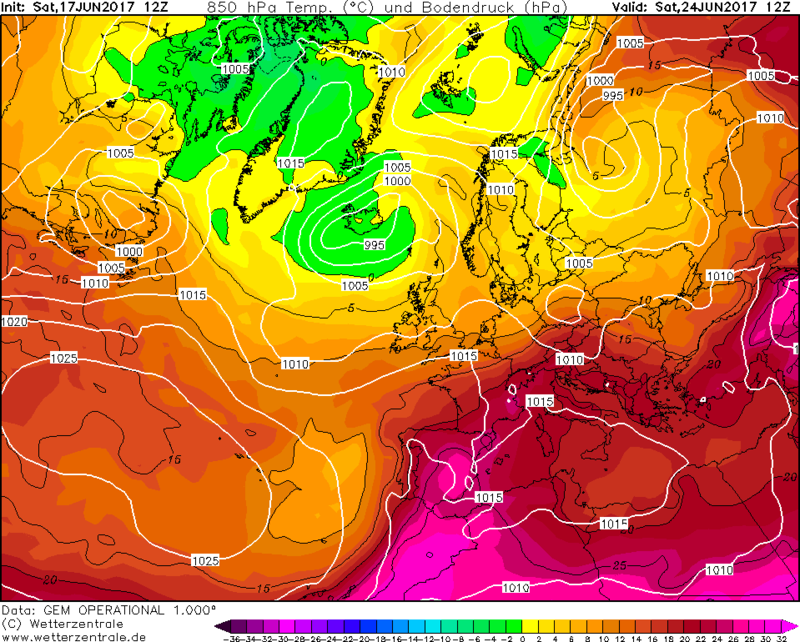 I think we will be chasing heat like this for the rest of summer, stunning charts and a very rare thing. Although over the last few summers plumes like this are becoming ever more common. Still looking decent this morning, ECM has the 20c isotherm clipping the south for a time Thursday. Bit more of a trend to sweep the heat away more quickly, possibly through Thursday, so this could perhaps inhibit the super high temperatures we might have expected yesterday....but 30c will still be breached. Not looking desperately unsettled after, just more standard British weather. Going to be a bit of a shock to some by the weekend, especially in the NW where it could be pretty cool! 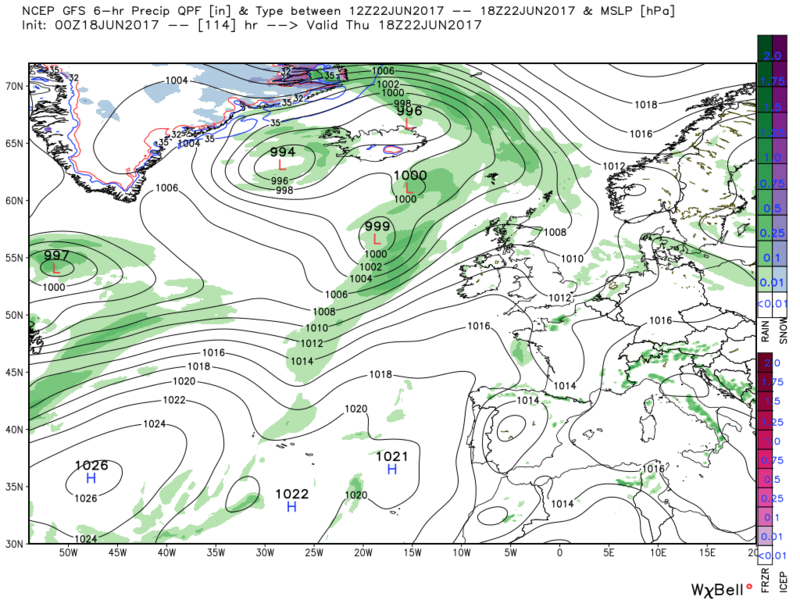 The ecm continues to treat the upper trough disruption differently to the gfs thus a different surface evolution this week. 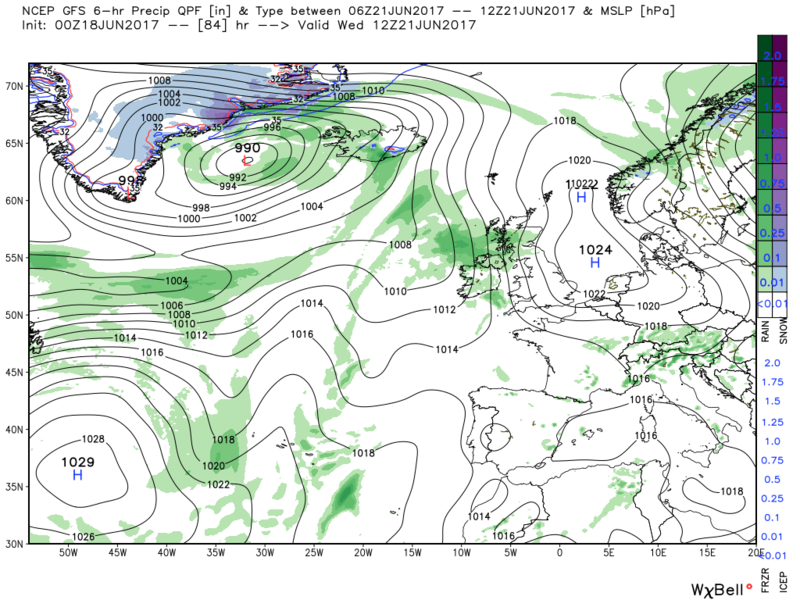 On Wednesday it quickly relegates the cut off upper low further south to be west of Portugal which results in two things. The final flurry of WAA into most of England and Wales is now on Wednesday and it pushes the door a little further ajar for the main trough to the NW ti slip closer to the UK on it's travels. By 00z Saturday the surface low is north of Scotland with the UK in a fairly gentle NW airflow thus cooler (relatively) with perhaps some light showery activity but nothing drastic. After the weekend the Atlantic gets slightly more organized and a large low approaches from the west but this for another day.